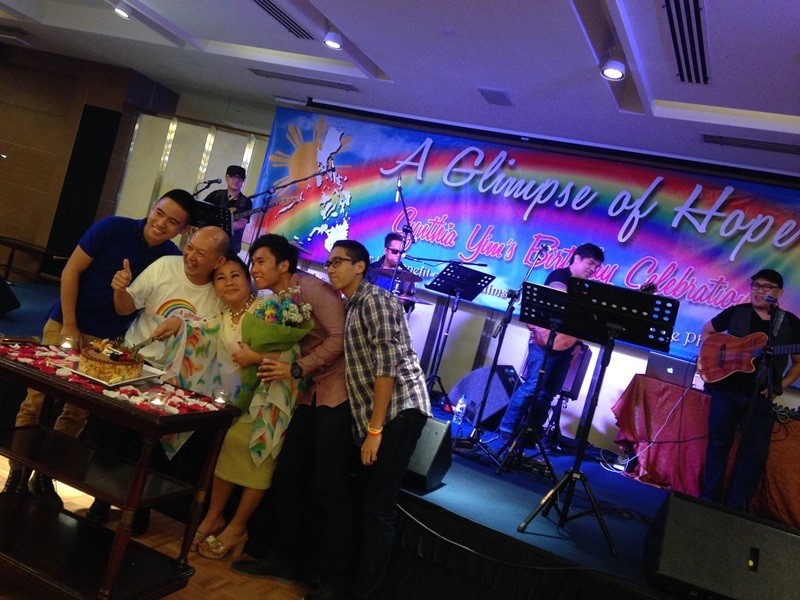 A loving couple and their friends give typhoon Haiyan victims a glimpse of hope after the storm. Mr. Jimmy and Mrs. Cynthia Yim have been married for 26 years. Jimmy is a managing director in one of Singapore’s top law firms and Cynthia, a Filipina, is a former professional singer. In every single year of their marriage, Jimmy throws a party to celebrate Cynthia’s birthday, which falls on December 15th. Last year was no different, except for one heartwarming twist. 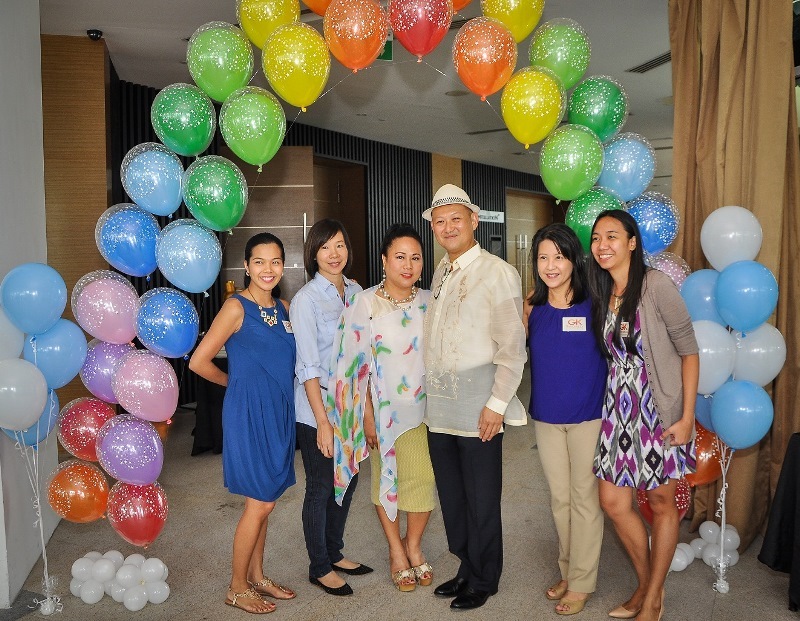 In light of the devastation left by super typhoon Haiyan, they decided to turn her celebration into a fundraiser to help Gawad Kalinga (GK) build homes for the survivors of the typhoon. 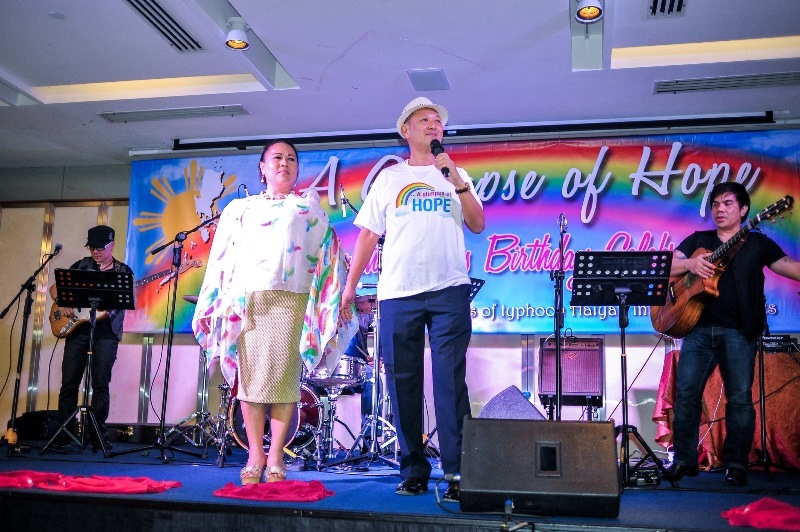 They called the fundraiser “A Glimpse of Hope” and had rainbow colours as a theme, as a rainbow symbolizes the promise of hope that comes after a storm. During our planning phase, Cynthia even noticed the happy coincidence that the colourful GK homes fit the theme! The brunch party was held at One°15 Marina Club, Sentosa, Singapore. Over 200 of the couple’s family & friends were in attendance, to celebrate Cynthia’s birthday and to support their cause. In lieu of gifts, Jimmy & Cynthia requested their friends to make a donation that will fund the building of homes in a community in Leyte. 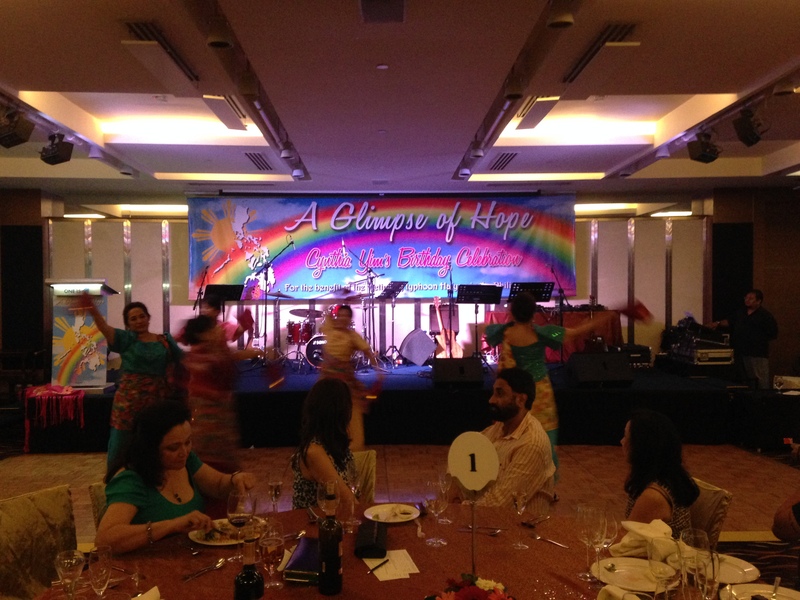 During the party some art pieces, jewelry, and hotel stays were also auctioned off to supplement the donations. Through everyone’s generosity, they raised enough funds to build 40 homes that will benefit the same number of families. They have chosen a site in Brgy. Quezon Jr. in Ormoc, Leyte on which this new GK village will be built. Ormoc is a coastal town, and one of the hardest hit areas of Philippines. This village, to which typhoon survivors from Ormoc will relocate, will be aptly called A Glimpse of Hope GK Village. This tremendously kind initiative by Jimmy & Cynthia, and the heartwarming generosity of their friends, will certainly give hope to the benefiting families to start rebuilding their lives. We hope that their story inspires more to keep supporting our efforts to help Haiyan survivors get back on their feet rebuild the lives affected. Truly, a display of “walang iwanan” spirit. Through the combined efforts and resources of partners, volunteers, GK workers and our very own residents, we have made significant headway in our roof repair, Balangay (fishing boats distribution) and housing reconstruction. Now we need YOU to help SCALE UP so we can each more families faster. Like Jimmy and Cynthia Yim, you too can be part of Operation Walang Iwanan and help GK in RAISE FUNDS for reconstruction.